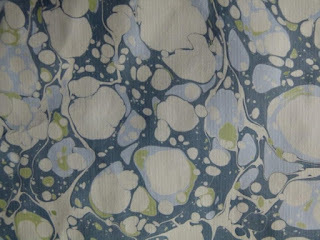 Until now, I've always been a little bit ambivalent about paper marbling - admiring the skills of those who do it well and loving the exoticism of materials such as carragheen moss and ox gall but, frankly, feeling that many of the finest of designs have been just a little too 'combed to death'. Apart from that, it always seems that about twice as much time is taken with setting up and cleaning down as is taken with marbling. I say 'until now' because I had the opportunity to spend yesterday as a bit of an imposter in an advanced marbling workshop run by renowned Australian marbler Joan Ajala and discovered that it's all a lot more fun than I had remembered. It was great to work with people who knew what they were doing and although my own papers have plenty of flaws they are big, bold and, dare I say it, unfussy. It will give me a lot of pleasure to work with the good bits of the sheets that are now draped drying around BEMBindery. I learnt marbling from Vi Wilson who used to supply marbled papers to John and Joy Tonkin, but like you I've always been a bit ambivalent about it and I often don't feel that marbled end papers suit the books I make.